This article is about the table used in chemistry and physics. For other uses, see Periodic table (disambiguation). The periodic table, also known as the periodic table of elements, is a tabular display of the chemical elements, which are arranged by atomic number, electron configuration, and recurring chemical properties. The structure of the table shows periodic trends. The seven rows of the table, called periods, generally have metals on the left and non-metals on the right. The columns, called groups, contain elements with similar chemical behaviours. Six groups have accepted names as well as assigned numbers: for example, group 17 elements are the halogens; and group 18 are the noble gases. Also displayed are four simple rectangular areas or blocks associated with the filling of different atomic orbitals. The organization of the periodic table can be used to derive relationships between the various element properties, and also to predict chemical properties and behaviours of undiscovered or newly synthesized elements. Russian chemist Dmitri Mendeleev published the first recognizable periodic table in 1869, developed mainly to illustrate periodic trends of the then-known elements. He also predicted some properties of unidentified elements that were expected to fill gaps within the table. Most of his forecasts proved to be correct. Mendeleev's idea has been slowly expanded and refined with the discovery or synthesis of further new elements and the development of new theoretical models to explain chemical behaviour. The modern periodic table now provides a useful framework for analyzing chemical reactions, and continues to be widely used in chemistry, nuclear physics and other sciences. The elements from atomic numbers 1 (hydrogen) through 118 (oganesson) have been discovered or synthesized, completing seven full rows of the periodic table. The first 94 elements all occur naturally, though some are found only in trace amounts and a few were discovered in nature only after having first been synthesized. [n 1] Elements 95 to 118 have only been synthesized in laboratories or nuclear reactors. The synthesis of elements having higher atomic numbers is currently being pursued: these elements would begin an eighth row, and theoretical work has been done to suggest possible candidates for this extension. Numerous synthetic radionuclides of naturally occurring elements have also been produced in laboratories. For a more detailed periodic table, see Periodic table (detailed cells). Each chemical element has a unique atomic number (Z) representing the number of protons in its nucleus. [n 2] Most elements have differing numbers of neutrons among different atoms, with these variants being referred to as isotopes. For example, carbon has three naturally occurring isotopes: all of its atoms have six protons and most have six neutrons as well, but about one per cent have seven neutrons, and a very small fraction have eight neutrons. Isotopes are never separated in the periodic table; they are always grouped together under a single element. Elements with no stable isotopes have the atomic masses of their most stable isotopes, where such masses are shown, listed in parentheses. In the standard periodic table, the elements are listed in order of increasing atomic number Z (the number of protons in the nucleus of an atom). A new row (period) is started when a new electron shell has its first electron. Columns (groups) are determined by the electron configuration of the atom; elements with the same number of electrons in a particular subshell fall into the same columns (e.g. oxygen and selenium are in the same column because they both have four electrons in the outermost p-subshell). Elements with similar chemical properties generally fall into the same group in the periodic table, although in the f-block, and to some respect in the d-block, the elements in the same period tend to have similar properties, as well. Thus, it is relatively easy to predict the chemical properties of an element if one knows the properties of the elements around it. Since 2016, the periodic table has 118 confirmed elements, from element 1 (hydrogen) to 118 (oganesson). Elements 113, 115, 117 and 118, the most recent discoveries, were officially confirmed by the International Union of Pure and Applied Chemistry (IUPAC) in December 2015. Their proposed names, nihonium (Nh), moscovium (Mc), tennessine (Ts) and oganesson (Og) respectively, were announced by the IUPAC in June 2016 and made official in November 2016. The first 94 elements occur naturally; the remaining 24, americium to oganesson (95–118), occur only when synthesized in laboratories. Of the 94 naturally occurring elements, 83 are primordial and 11 occur only in decay chains of primordial elements. No element heavier than einsteinium (element 99) has ever been observed in macroscopic quantities in its pure form, nor has astatine (element 85); francium (element 87) has been only photographed in the form of light emitted from microscopic quantities (300,000 atoms). A group or family is a vertical column in the periodic table. Groups usually have more significant periodic trends than periods and blocks, explained below. Modern quantum mechanical theories of atomic structure explain group trends by proposing that elements within the same group generally have the same electron configurations in their valence shell. Consequently, elements in the same group tend to have a shared chemistry and exhibit a clear trend in properties with increasing atomic number. In some parts of the periodic table, such as the d-block and the f-block, horizontal similarities can be as important as, or more pronounced than, vertical similarities. Under an international naming convention, the groups are numbered numerically from 1 to 18 from the leftmost column (the alkali metals) to the rightmost column (the noble gases). Previously, they were known by roman numerals. In America, the roman numerals were followed by either an "A" if the group was in the s- or p-block, or a "B" if the group was in the d-block. The roman numerals used correspond to the last digit of today's naming convention (e.g. the group 4 elements were group IVB, and the group 14 elements were group IVA). In Europe, the lettering was similar, except that "A" was used if the group was before group 10, and "B" was used for groups including and after group 10. In addition, groups 8, 9 and 10 used to be treated as one triple-sized group, known collectively in both notations as group VIII. In 1988, the new IUPAC naming system was put into use, and the old group names were deprecated. Some of these groups have been given trivial (unsystematic) names, as seen in the table below, although some are rarely used. Groups 3–10 have no trivial names and are referred to simply by their group numbers or by the name of the first member of their group (such as "the scandium group" for group 3), since they display fewer similarities and/or vertical trends. Elements in the same group tend to show patterns in atomic radius, ionization energy, and electronegativity. From top to bottom in a group, the atomic radii of the elements increase. Since there are more filled energy levels, valence electrons are found farther from the nucleus. From the top, each successive element has a lower ionization energy because it is easier to remove an electron since the atoms are less tightly bound. Similarly, a group has a top-to-bottom decrease in electronegativity due to an increasing distance between valence electrons and the nucleus. There are exceptions to these trends: for example, in group 11, electronegativity increases farther down the group. a Group 3 has scandium (Sc) and yttrium (Y). For the rest of the group, sources differ as either being (1) lutetium (Lu) and lawrencium (Lr), or (2) lanthanum (La) and actinium (Ac), or (3) the whole set of 15+15 lanthanides and actinides. IUPAC has initiated a project to standardize the definition as either (1) Sc, Y, Lu and Lr, or (2) Sc, Y, La and Ac. b Group 18, the noble gases, were not discovered at the time of Mendeleev's original table. Later (1902), Mendeleev accepted the evidence for their existence, and they could be placed in a new "group 0", consistently and without breaking the periodic table principle. r Group name as recommended by IUPAC. h Hydrogen (H), while placed in group 1, is not considered to be part of the alkali metals. A period is a horizontal row in the periodic table. Although groups generally have more significant periodic trends, there are regions where horizontal trends are more significant than vertical group trends, such as the f-block, where the lanthanides and actinides form two substantial horizontal series of elements. Elements in the same period show trends in atomic radius, ionization energy, electron affinity, and electronegativity. Moving left to right across a period, atomic radius usually decreases. This occurs because each successive element has an added proton and electron, which causes the electron to be drawn closer to the nucleus. This decrease in atomic radius also causes the ionization energy to increase when moving from left to right across a period. The more tightly bound an element is, the more energy is required to remove an electron. Electronegativity increases in the same manner as ionization energy because of the pull exerted on the electrons by the nucleus. Electron affinity also shows a slight trend across a period. Metals (left side of a period) generally have a lower electron affinity than nonmetals (right side of a period), with the exception of the noble gases. Specific regions of the periodic table can be referred to as blocks in recognition of the sequence in which the electron shells of the elements are filled. Each block is named according to the subshell in which the "last" electron notionally resides. [n 3] The s-block comprises the first two groups (alkali metals and alkaline earth metals) as well as hydrogen and helium. The p-block comprises the last six groups, which are groups 13 to 18 in IUPAC group numbering (3A to 8A in American group numbering) and contains, among other elements, all of the metalloids. The d-block comprises groups 3 to 12 (or 3B to 2B in American group numbering) and contains all of the transition metals. The f-block, often offset below the rest of the periodic table, has no group numbers and comprises lanthanides and actinides. Metals, metalloids, nonmetals, and elements with unknown chemical properties in the periodic table. Sources disagree on the classification of some of these elements. According to their shared physical and chemical properties, the elements can be classified into the major categories of metals, metalloids and nonmetals. Metals are generally shiny, highly conducting solids that form alloys with one another and salt-like ionic compounds with nonmetals (other than noble gases). A majority of nonmetals are coloured or colourless insulating gases; nonmetals that form compounds with other nonmetals feature covalent bonding. In between metals and nonmetals are metalloids, which have intermediate or mixed properties. Metal and nonmetals can be further classified into subcategories that show a gradation from metallic to non-metallic properties, when going left to right in the rows. The metals may be subdivided into the highly reactive alkali metals, through the less reactive alkaline earth metals, lanthanides and actinides, via the archetypal transition metals, and ending in the physically and chemically weak post-transition metals. Nonmetals may be simply subdivided into the polyatomic nonmetals, being nearer to the metalloids and show some incipient metallic character; the essentially nonmetallic diatomic nonmetals, nonmetallic and the almost completely inert, monatomic noble gases. Specialized groupings such as refractory metals and noble metals, are examples of subsets of transition metals, also known and occasionally denoted. Placing elements into categories and subcategories based just on shared properties is imperfect. There is a large disparity of properties within each category with notable overlaps at the boundaries, as is the case with most classification schemes. Beryllium, for example, is classified as an alkaline earth metal although its amphoteric chemistry and tendency to mostly form covalent compounds are both attributes of a chemically weak or post-transition metal. Radon is classified as a nonmetallic noble gas yet has some cationic chemistry that is characteristic of metals. Other classification schemes are possible such as the division of the elements into mineralogical occurrence categories, or crystalline structures. Categorizing the elements in this fashion dates back to at least 1869 when Hinrichs wrote that simple boundary lines could be placed on the periodic table to show elements having shared properties, such as metals, nonmetals, or gaseous elements. The electron configuration or organisation of electrons orbiting neutral atoms shows a recurring pattern or periodicity. The electrons occupy a series of electron shells (numbered 1, 2, and so on). Each shell consists of one or more subshells (named s, p, d, f and g). As atomic number increases, electrons progressively fill these shells and subshells more or less according to the Madelung rule or energy ordering rule, as shown in the diagram. The electron configuration for neon, for example, is 1s2 2s2 2p6. With an atomic number of ten, neon has two electrons in the first shell, and eight electrons in the second shell; there are two electrons in the s subshell and six in the p subshell. In periodic table terms, the first time an electron occupies a new shell corresponds to the start of each new period, these positions being occupied by hydrogen and the alkali metals. Since the properties of an element are mostly determined by its electron configuration, the properties of the elements likewise show recurring patterns or periodic behaviour, some examples of which are shown in the diagrams below for atomic radii, ionization energy and electron affinity. It is this periodicity of properties, manifestations of which were noticed well before the underlying theory was developed, that led to the establishment of the periodic law (the properties of the elements recur at varying intervals) and the formulation of the first periodic tables. 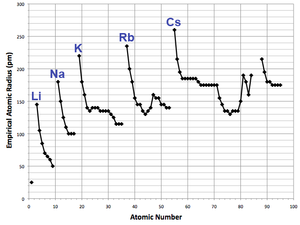 Atomic radii vary in a predictable and explainable manner across the periodic table. For instance, the radii generally decrease along each period of the table, from the alkali metals to the noble gases; and increase down each group. The radius increases sharply between the noble gas at the end of each period and the alkali metal at the beginning of the next period. These trends of the atomic radii (and of various other chemical and physical properties of the elements) can be explained by the electron shell theory of the atom; they provided important evidence for the development and confirmation of quantum theory. The electrons in the 4f-subshell, which is progressively filled across the lanthanide series, are not particularly effective at shielding the increasing nuclear charge from the sub-shells further out. The elements immediately following the lanthanides have atomic radii that are smaller than would be expected and that are almost identical to the atomic radii of the elements immediately above them. Hence hafnium has virtually the same atomic radius (and chemistry) as zirconium, and tantalum has an atomic radius similar to niobium, and so forth. This is known as the lanthanide contraction. The effect of the lanthanide contraction is noticeable up to platinum (element 78), after which it is masked by a relativistic effect known as the inert pair effect. The d-block contraction, which is a similar effect between the d-block and p-block, is less pronounced than the lanthanide contraction but arises from a similar cause. The first ionization energy is the energy it takes to remove one electron from an atom, the second ionization energy is the energy it takes to remove a second electron from the atom, and so on. For a given atom, successive ionization energies increase with the degree of ionization. For magnesium as an example, the first ionization energy is 738 kJ/mol and the second is 1450 kJ/mol. Electrons in the closer orbitals experience greater forces of electrostatic attraction; thus, their removal requires increasingly more energy. Ionization energy becomes greater up and to the right of the periodic table. Large jumps in the successive molar ionization energies occur when removing an electron from a noble gas (complete electron shell) configuration. For magnesium again, the first two molar ionization energies of magnesium given above correspond to removing the two 3s electrons, and the third ionization energy is a much larger 7730 kJ/mol, for the removal of a 2p electron from the very stable neon-like configuration of Mg2+. Similar jumps occur in the ionization energies of other third-row atoms. Electronegativity is the tendency of an atom to attract a shared pair of electrons. An atom's electronegativity is affected by both its atomic number and the distance between the valence electrons and the nucleus. The higher its electronegativity, the more an element attracts electrons. It was first proposed by Linus Pauling in 1932. In general, electronegativity increases on passing from left to right along a period, and decreases on descending a group. Hence, fluorine is the most electronegative of the elements,[n 5] while caesium is the least, at least of those elements for which substantial data is available. There are some exceptions to this general rule. Gallium and germanium have higher electronegativities than aluminium and silicon respectively because of the d-block contraction. Elements of the fourth period immediately after the first row of the transition metals have unusually small atomic radii because the 3d-electrons are not effective at shielding the increased nuclear charge, and smaller atomic size correlates with higher electronegativity. The anomalously high electronegativity of lead, particularly when compared to thallium and bismuth, appears to be an artifact of data selection and data availability. Methods of calculation other than the Pauling method show the normal periodic trends for these elements. Dependence of electron affinity on atomic number. Values generally increase across each period, culminating with the halogens before decreasing precipitously with the noble gases. Examples of localized peaks seen in hydrogen, the alkali metals and the group 11 elements are caused by a tendency to complete the s-shell (with the 6s shell of gold being further stabilized by relativistic effects and the presence of a filled 4f sub shell). Examples of localized troughs seen in the alkaline earth metals, and nitrogen, phosphorus, manganese and rhenium are caused by filled s-shells, or half-filled p- or d-shells. The electron affinity of an atom is the amount of energy released when an electron is added to a neutral atom to form a negative ion. Although electron affinity varies greatly, some patterns emerge. Generally, nonmetals have more positive electron affinity values than metals. Chlorine most strongly attracts an extra electron. The electron affinities of the noble gases have not been measured conclusively, so they may or may not have slightly negative values. 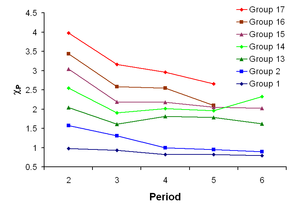 Electron affinity generally increases across a period. This is caused by the filling of the valence shell of the atom; a group 17 atom releases more energy than a group 1 atom on gaining an electron because it obtains a filled valence shell and is therefore more stable. A trend of decreasing electron affinity going down groups would be expected. The additional electron will be entering an orbital farther away from the nucleus. As such this electron would be less attracted to the nucleus and would release less energy when added. In going down a group, around one-third of elements are anomalous, with heavier elements having higher electron affinities than their next lighter congenors. Largely, this is due to the poor shielding by d and f electrons. A uniform decrease in electron affinity only applies to group 1 atoms. The lower the values of ionization energy, electronegativity and electron affinity, the more metallic character the element has. Conversely, nonmetallic character increases with higher values of these properties. Given the periodic trends of these three properties, metallic character tends to decrease going across a period (or row) and, with some irregularities (mostly) due to poor screening of the nucleus by d and f electrons, and relativistic effects, tends to increase going down a group (or column or family). 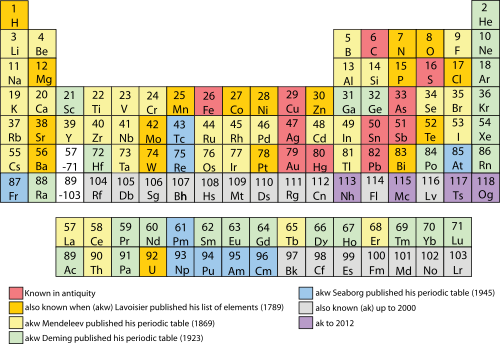 Thus, the most metallic elements (such as caesium and francium) are found at the bottom left of traditional periodic tables and the most nonmetallic elements (oxygen, fluorine, chlorine) at the top right. The combination of horizontal and vertical trends in metallic character explains the stair-shaped dividing line between metals and nonmetals found on some periodic tables, and the practice of sometimes categorizing several elements adjacent to that line, or elements adjacent to those elements, as metalloids. From left to right across the four blocks of the long- or 32-column form of the periodic table are a series of linking or bridging groups of elements, located approximately between each block. These groups, like the metalloids, show properties in between, or that are a mixture of, groups to either side. Chemically, the group 3 elements, scandium, yttrium, lanthanum and actinium behave largely like the alkaline earth metals or, more generally, s block metals but have some of the physical properties of d block transition metals. Lutetium and lawrencium, at the end of the end of the f block, may constitute another linking or bridging group. Lutetium behaves chemically as a lanthanide but shows a mix of lanthanide and transition metal physical properties. Lawrencium, as an analogue of lutetium, would presumably display like characteristics. [n 6] The coinage metals in group 11 (copper, silver, and gold) are chemically capable of acting as either transition metals or main group metals. The volatile group 12 metals, zinc, cadmium and mercury are sometimes regarded as linking the d block to the p block. Notionally they are d block elements but they have few transition metal properties and are more like their p block neighbors in group 13. The relatively inert noble gases, in group 18, bridge the most reactive groups of elements in the periodic table—the halogens in group 17 and the alkali metals in group 1. In 1789, Antoine Lavoisier published a list of 33 chemical elements, grouping them into gases, metals, nonmetals, and earths. Chemists spent the following century searching for a more precise classification scheme. In 1829, Johann Wolfgang Döbereiner observed that many of the elements could be grouped into triads based on their chemical properties. Lithium, sodium, and potassium, for example, were grouped together in a triad as soft, reactive metals. Döbereiner also observed that, when arranged by atomic weight, the second member of each triad was roughly the average of the first and the third. This became known as the Law of Triads. German chemist Leopold Gmelin worked with this system, and by 1843 he had identified ten triads, three groups of four, and one group of five. Jean-Baptiste Dumas published work in 1857 describing relationships between various groups of metals. Although various chemists were able to identify relationships between small groups of elements, they had yet to build one scheme that encompassed them all. In 1857, German chemist August Kekulé observed that carbon often has four other atoms bonded to it. Methane, for example, has one carbon atom and four hydrogen atoms. This concept eventually became known as valency, where different elements bond with different numbers of atoms. In 1862, Alexandre-Emile Béguyer de Chancourtois, a French geologist, published an early form of periodic table, which he called the telluric helix or screw. He was the first person to notice the periodicity of the elements. With the elements arranged in a spiral on a cylinder by order of increasing atomic weight, de Chancourtois showed that elements with similar properties seemed to occur at regular intervals. His chart included some ions and compounds in addition to elements. His paper also used geological rather than chemical terms and did not include a diagram. As a result, it received little attention until the work of Dmitri Mendeleev. In 1864, Julius Lothar Meyer, a German chemist, published a table with 28 elements. Realizing that an arrangement according to atomic weight did not exactly fit the observed periodicity in chemical properties he gave valency priority over minor differences in atomic weight. A missing element between Si and Sn was predicted with atomic weight 73 and valency 4. Concurrently, English chemist William Odling published an arrangement of 57 elements, ordered on the basis of their atomic weights. With some irregularities and gaps, he noticed what appeared to be a periodicity of atomic weights among the elements and that this accorded with "their usually received groupings". Odling alluded to the idea of a periodic law but did not pursue it. He subsequently proposed (in 1870) a valence-based classification of the elements. English chemist John Newlands produced a series of papers from 1863 to 1866 noting that when the elements were listed in order of increasing atomic weight, similar physical and chemical properties recurred at intervals of eight. He likened such periodicity to the octaves of music. This so termed Law of Octaves was ridiculed by Newlands' contemporaries, and the Chemical Society refused to publish his work. Newlands was nonetheless able to draft a table of the elements and used it to predict the existence of missing elements, such as germanium. The Chemical Society only acknowledged the significance of his discoveries five years after they credited Mendeleev. In 1867, Gustavus Hinrichs, a Danish born academic chemist based in America, published a spiral periodic system based on atomic spectra and weights, and chemical similarities. His work was regarded as idiosyncratic, ostentatious and labyrinthine and this may have militated against its recognition and acceptance. A version of Mendeleev's 1869 periodic table: An experiment on a system of elements based on their atomic weights and chemical similarities. This early arrangement presents the periods vertically and the groups horizontally. Russian chemistry professor Dmitri Mendeleev and German chemist Julius Lothar Meyer independently published their periodic tables in 1869 and 1870, respectively. Mendeleev's table, dated March 1 [O.S. February 17] 1869, was his first published version. That of Meyer was an expanded version of his (Meyer's) table of 1864. They both constructed their tables by listing the elements in rows or columns in order of atomic weight and starting a new row or column when the characteristics of the elements began to repeat. The recognition and acceptance afforded to Mendeleev's table came from two decisions he made. The first was to leave gaps in the table when it seemed that the corresponding element had not yet been discovered. Mendeleev was not the first chemist to do so, but he was the first to be recognized as using the trends in his periodic table to predict the properties of those missing elements, such as gallium and germanium. The second decision was to occasionally ignore the order suggested by the atomic weights and switch adjacent elements, such as tellurium and iodine, to better classify them into chemical families. Mendeleev published in 1869, using atomic weight to organize the elements, information determinable to fair precision in his time. Atomic weight worked well enough to allow Mendeleev to accurately predict the properties of missing elements. Following the discovery of the atomic nucleus by Ernest Rutherford in 1911, it was proposed that the integer count of the nuclear charge is identical to the sequential place of each element in the periodic table. In 1913, Henry Moseley using X-ray spectroscopy confirmed this proposal experimentally. Moseley determined the value of the nuclear charge of each element and showed that Mendeleev's ordering actually places the elements in sequential order by nuclear charge. Nuclear charge is identical to proton count and determines the value of the atomic number (Z) of each element. Using atomic number gives a definitive, integer-based sequence for the elements. Moseley predicted, in 1913, that the only elements still missing between aluminium (Z = 13) and gold (Z = 79) were Z = 43, 61, 72, and 75, all of which were later discovered. The atomic number is the absolute definition of an element and gives a factual basis for the ordering of the periodic table. In other words, since the atomic number of an element is the same as the number of protons in its nucleus, the modern periodic table arranges the elements according to their atomic number, and relative to their atomic mass, the way Mendeleev did. The periodic table is used to predict the properties of new synthetic elements before they are produced and studied. Mendeleev's 1871 periodic table with eight groups of elements. Dashes represented elements unknown in 1871. In 1871, Mendeleev published his periodic table in a new form, with groups of similar elements arranged in columns rather than in rows, and those columns numbered I to VIII corresponding with the element's oxidation state. He also gave detailed predictions for the properties of elements he had earlier noted were missing, but should exist. These gaps were subsequently filled as chemists discovered additional naturally occurring elements. It is often stated that the last naturally occurring element to be discovered was francium (referred to by Mendeleev as eka-caesium) in 1939. Plutonium, produced synthetically in 1940, was identified in trace quantities as a naturally occurring element in 1971. 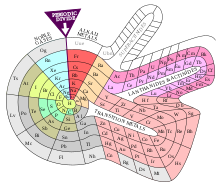 The popular periodic table layout, also known as the common or standard form (as shown at various other points in this article), is attributable to Horace Groves Deming. In 1923, Deming, an American chemist, published short (Mendeleev style) and medium (18-column) form periodic tables. [n 7] Merck and Company prepared a handout form of Deming's 18-column medium table, in 1928, which was widely circulated in American schools. By the 1930s Deming's table was appearing in handbooks and encyclopedias of chemistry. It was also distributed for many years by the Sargent-Welch Scientific Company. With the development of modern quantum mechanical theories of electron configurations within atoms, it became apparent that each period (row) in the table corresponded to the filling of a quantum shell of electrons. Larger atoms have more electron sub-shells, so later tables have required progressively longer periods. Although minute quantities of some transuranic elements occur naturally, they were all first discovered in laboratories. Their production has expanded the periodic table significantly, the first of these being neptunium, synthesized in 1939. Because many of the transuranic elements are highly unstable and decay quickly, they are challenging to detect and characterize when produced. There have been controversies concerning the acceptance of competing discovery claims for some elements, requiring independent review to determine which party has priority, and hence naming rights. In 2010, a joint Russia–US collaboration at Dubna, Moscow Oblast, Russia, claimed to have synthesized six atoms of tennessine (element 117), making it the most recently claimed discovery. It, along with nihonium (element 113), moscovium (element 115), and oganesson (element 118), are the four most recently named elements, whose names all became official on 28 November 2016. The modern periodic table is sometimes expanded into its long or 32-column form by reinstating the footnoted f-block elements into their natural position between the s- and d-blocks. Unlike the 18-column form this arrangement results in "no interruptions in the sequence of increasing atomic numbers". The relationship of the f-block to the other blocks of the periodic table also becomes easier to see. Jensen advocates a form of table with 32 columns on the grounds that the lanthanides and actinides are otherwise relegated in the minds of students as dull, unimportant elements that can be quarantined and ignored. Despite these advantages the 32-column form is generally avoided by editors on account of its undue rectangular ratio compared to a book page ratio, and the familiarity of chemists with the modern form, as introduced by Seaborg. Within 100 years of the appearance of Mendeleev's table in 1869, Edward G. Mazurs had collected an estimated 700 different published versions of the periodic table. As well as numerous rectangular variations, other periodic table formats have been shaped, for example,[n 9] like a circle, cube, cylinder, building, spiral, lemniscate, octagonal prism, pyramid, sphere, or triangle. Such alternatives are often developed to highlight or emphasize chemical or physical properties of the elements that are not as apparent in traditional periodic tables. A popular alternative structure is that of Otto Theodor Benfey (1960). The elements are arranged in a continuous spiral, with hydrogen at the centre and the transition metals, lanthanides, and actinides occupying peninsulas. Most periodic tables are two-dimensional; three-dimensional tables are known to as far back as at least 1862 (pre-dating Mendeleev's two-dimensional table of 1869). More recent examples include Courtines' Periodic Classification (1925), Wringley's Lamina System (1949),Giguère's Periodic helix (1965) and Dufour's Periodic Tree (1996). Going one further, Stowe's Physicist's Periodic Table (1989) has been described as being four-dimensional (having three spatial dimensions and one colour dimension). The various forms of periodic tables can be thought of as lying on a chemistry–physics continuum. Towards the chemistry end of the continuum can be found, as an example, Rayner-Canham's "unruly" Inorganic Chemist's Periodic Table (2002), which emphasizes trends and patterns, and unusual chemical relationships and properties. Near the physics end of the continuum is Janet's Left-Step Periodic Table (1928). This has a structure that shows a closer connection to the order of electron-shell filling and, by association, quantum mechanics. A somewhat similar approach has been taken by Alper, albeit criticized by Eric Scerri as disregarding the need to display chemical and physical periodicity. Somewhere in the middle of the continuum is the ubiquitous common or standard form of periodic table. This is regarded as better expressing empirical trends in physical state, electrical and thermal conductivity, and oxidation numbers, and other properties easily inferred from traditional techniques of the chemical laboratory. Its popularity is thought to be a result of this layout having a good balance of features in terms of ease of construction and size, and its depiction of atomic order and periodic trends. Simply following electron configurations, hydrogen (electronic configuration 1s1) and helium (1s2) should be placed in groups 1 and 2, above lithium (1s22s1) and beryllium (1s22s2). While such a placement is common for hydrogen, it is rarely used for helium outside of the context of electron configurations: When the noble gases (then called "inert gases") were first discovered around 1900, they were known as "group 0", reflecting no chemical reactivity of these elements known at that point, and helium was placed on the top of that group, as it did share the extreme chemical inertness seen throughout the group. As the group changed its formal number, many authors continued to assign helium directly above neon, in group 18; one of the examples of such placing is the current IUPAC table. The position of hydrogen in group 1 is reasonably well settled. Its usual oxidation state is +1 as is the case for its heavier alkali metal congeners. Like lithium, it has a significant covalent chemistry. It can stand in for alkali metals in typical alkali metal structures. It is capable of forming alloy-like hydrides, featuring metallic bonding, with some transition metals. Nevertheless, it is sometimes placed elsewhere. A common alternative is at the top of group 17 given hydrogen's strictly univalent and largely non-metallic chemistry, and the strictly univalent and non-metallic chemistry of fluorine (the element otherwise at the top of group 17). Sometimes, to show hydrogen has properties corresponding to both those of the alkali metals and the halogens, it is shown at the top of the two columns simultaneously. Another suggestion is above carbon in group 14: placed that way, it fits well into the trends of increasing ionization potential values and electron affinity values, and is not too far from the electronegativity trend, even though hydrogen cannot show the tetravalence characteristic of the heavier group 14 elements. Finally, hydrogen is sometimes placed separately from any group; this is based on its general properties being regarded as sufficiently different from those of the elements in any other group. The other period 1 element, helium, is occasionally placed separately from any group as well. The property that distinguishes helium from the rest of the noble gases (even though the extraordinary inertness of helium is extremely close to that of neon and argon) is that in its closed electron shell, helium has only two electrons in the outermost electron orbital, while the rest of the noble gases have eight. Although scandium and yttrium are always the first two elements in group 3, the identity of the next two elements is not completely settled. They are commonly lanthanum and actinium, and less often lutetium and lawrencium. The two variants originate from historical difficulties in placing the lanthanides in the periodic table, and arguments as to where the f block elements start and end. [n 10][n 11] It has been claimed that such arguments are proof that, "it is a mistake to break the [periodic] system into sharply delimited blocks". A third variant shows the two positions below yttrium as being occupied by the lanthanides and the actinides. A fourth variant shows group 3 bifurcating after Sc-Y, into an La-Ac branch, and an Lu-Lr branch. Chemical and physical arguments have been made in support of lutetium and lawrencium but the majority of authors seem unconvinced. Most working chemists are not aware there is any controversy. In December 2015 an IUPAC project was established to make a recommendation on the matter. Lanthanum and actinium are commonly depicted as the remaining group 3 members. [n 12] It has been suggested that this layout originated in the 1940s, with the appearance of periodic tables relying on the electron configurations of the elements and the notion of the differentiating electron. The configurations of caesium, barium and lanthanum are [Xe]6s1, [Xe]6s2 and [Xe]5d16s2. Lanthanum thus has a 5d differentiating electron and this establishes it "in group 3 as the first member of the d-block for period 6". A consistent set of electron configurations is then seen in group 3: scandium [Ar]3d14s2, yttrium [Kr]4d15s2 and lanthanum [Xe]5d16s2. Still in period 6, ytterbium was assigned an electron configuration of [Xe]4f135d16s2 and lutetium [Xe]4f145d16s2, "resulting in a 4f differentiating electron for lutetium and firmly establishing it as the last member of the f-block for period 6". Later spectroscopic work found that the electron configuration of ytterbium was in fact [Xe]4f146s2. This meant that ytterbium and lutetium—the latter with [Xe]4f145d16s2—both had 14 f-electrons, "resulting in a d- rather than an f- differentiating electron" for lutetium and making it an "equally valid candidate" with [Xe]5d16s2 lanthanum, for the group 3 periodic table position below yttrium. Lanthanum has the advantage of incumbency since the 5d1 electron appears for the first time in its structure whereas it appears for the third time in lutetium, having also made a brief second appearance in gadolinium. In terms of chemical behaviour, and trends going down group 3 for properties such as melting point, electronegativity and ionic radius, scandium, yttrium, lanthanum and actinium are similar to their group 1–2 counterparts. In this variant, the number of f electrons in the most common (trivalent) ions of the f-block elements consistently matches their position in the f-block. For example, the f-electron counts for the trivalent ions of the first three f-block elements are Ce 1, Pr 2 and Nd 3. Chemically, scandium, yttrium and lutetium (and presumably lawrencium) behave like trivalent versions of the group 1–2 metals. On the other hand, trends going down the group for properties such as melting point, electronegativity and ionic radius, are similar to those found among their group 4–8 counterparts. In this variant, the number of f electrons in the gaseous forms of the f-block atoms usually matches their position in the f-block. For example, the f-electron counts for the first five f-block elements are La 0, Ce 1, Pr 3, Nd 4 and Pm 5. In this variant, group 3 bifurcates after Sc-Y into a La-Ac branch, and a Lu-Lr branch. This arrangement is consistent with the hypothesis that arguments in favour of either Sc-Y-La-Ac or Sc-Y-Lu-Lr based on chemical and physical data are inconclusive. As noted, trends going down Sc-Y-La-Ac match trends in groups 1−2 whereas trends going down Sc-Y-Lu-Lr better match trends in groups 4−10. The definition of a transition metal, as given by IUPAC, is an element whose atom has an incomplete d sub-shell, or which can give rise to cations with an incomplete d sub-shell. By this definition all of the elements in groups 3–11 are transition metals. The IUPAC definition therefore excludes group 12, comprising zinc, cadmium and mercury, from the transition metals category. Some chemists treat the categories "d-block elements" and "transition metals" interchangeably, thereby including groups 3–12 among the transition metals. In this instance the group 12 elements are treated as a special case of transition metal in which the d electrons are not ordinarily involved in chemical bonding. The 2007 report of mercury(IV) fluoride (HgF4), a compound in which mercury would use its d electrons for bonding, has prompted some commentators to suggest that mercury can be regarded as a transition metal. Other commentators, such as Jensen, have argued that the formation of a compound like HgF4 can occur only under highly abnormal conditions; indeed, its existence is currently disputed. As such, mercury could not be regarded as a transition metal by any reasonable interpretation of the ordinary meaning of the term. Still other chemists further exclude the group 3 elements from the definition of a transition metal. They do so on the basis that the group 3 elements do not form any ions having a partially occupied d shell and do not therefore exhibit any properties characteristic of transition metal chemistry. In this case, only groups 4–11 are regarded as transition metals. Though the group 3 elements show few of the characteristic chemical properties of the transition metals, they do show some of their characteristic physical properties (on account of the presence in each atom of a single d electron). Although all elements up to oganesson have been discovered, of the elements above hassium (element 108), only copernicium (element 112), nihonium (element 113), and flerovium (element 114) have known chemical properties, and only for copernicium is there enough evidence for a conclusive categorisation at present. The other elements may behave differently from what would be predicted by extrapolation, due to relativistic effects; for example, flerovium has been predicted to possibly exhibit some noble-gas-like properties, even though it is currently placed in the carbon group. The current experimental evidence still leaves open the question of whether flerovium behaves more like a metal or a noble gas. It is unclear whether new elements will continue the pattern of the current periodic table as period 8, or require further adaptations or adjustments. Seaborg expected the eighth period to follow the previously established pattern exactly, so that it would include a two-element s-block for elements 119 and 120, a new g-block for the next 18 elements, and 30 additional elements continuing the current f-, d-, and p-blocks, culminating in element 168, the next noble gas. More recently, physicists such as Pekka Pyykkö have theorized that these additional elements do not follow the Madelung rule, which predicts how electron shells are filled and thus affects the appearance of the present periodic table. There are currently several competing theoretical models for the placement of the elements of atomic number less than or equal to 172. In all of these it is element 172, rather than element 168, that emerges as the next noble gas after oganesson, although these must be regarded as speculative as no complete calculations have been done beyond element 123. The Bohr model exhibits difficulty for atoms with atomic number greater than 137, as any element with an atomic number greater than 137 would require 1s electrons to be travelling faster than c, the speed of light. Hence the non-relativistic Bohr model is inaccurate when applied to such an element. The relativistic Dirac equation has problems for elements with more than 137 protons. For such elements, the wave function of the Dirac ground state is oscillatory rather than bound, and there is no gap between the positive and negative energy spectra, as in the Klein paradox. More accurate calculations taking into account the effects of the finite size of the nucleus indicate that the binding energy first exceeds the limit for elements with more than 173 protons. For heavier elements, if the innermost orbital (1s) is not filled, the electric field of the nucleus will pull an electron out of the vacuum, resulting in the spontaneous emission of a positron. This does not happen if the innermost orbital is filled, so that element 173 is not necessarily the end of the periodic table. In celebration of the periodic table's 150th anniversary, the United Nations declared the year 2019 as the International Year of the Periodic Table, celebrating "one of the most significant achievements in science". ^ The elements discovered initially by synthesis and later in nature are technetium (Z=43), promethium (61), astatine (85), neptunium (93), plutonium (94), americium (95), curium (96), berkelium (97) and californium (98). ^ An element zero (i.e. a substance composed purely of neutrons), is included in a few alternate presentations, for example, in the Chemical Galaxy. ^ There is an inconsistency and some irregularities in this convention. Thus, helium is shown in the p-block but is actually an s-block element, and (for example) the d-subshell in the d-block is actually filled by the time group 11 is reached, rather than group 12. ^ The noble gases, astatine, francium, and all elements heavier than americium were left out as there is no data for them. ^ While fluorine is the most electronegative of the elements under the Pauling scale, neon is the most electronegative element under other scales, such as the Allen scale. ^ While Lr is thought to have a p rather than d electron in its ground-state electron configuration, and would therefore be expected to be a volatile metal capable of forming a +1 cation in solution like thallium, no evidence of either of these properties has been able to be obtained despite experimental attempts to do so. It was originally expected to have a d electron in its electron configuration and this may still be the case for metallic lawrencium, whereas gas phase atomic lawrencium is very likely thought to have a p electron. ^ An antecedent of Deming's 18-column table may be seen in Adams' 16-column Periodic Table of 1911. Adams omits the rare earths and the "radioactive elements" (i.e. the actinides) from the main body of his table and instead shows them as being "careted in only to save space" (rare earths between Ba and eka-Yt; radioactive elements between eka-Te and eka-I). See: Elliot Q. A. (1911). "A modification of the periodic table". Journal of the American Chemical Society. 33(5): 684–688 (687). ^ A second extra-long periodic table row, to accommodate known and undiscovered elements with an atomic weight greater than bismuth (thorium, protactinium and uranium, for example), had been postulated as far back as 1892. Most investigators considered that these elements were analogues of the third series transition elements, hafnium, tantalum and tungsten. The existence of a second inner transition series, in the form of the actinides, was not accepted until similarities with the electron structures of the lanthanides had been established. See: van Spronsen, J. W. (1969). The periodic system of chemical elements. Amsterdam: Elsevier. p. 315–316, ISBN 0-444-40776-6. ^ See The Internet database of periodic tables for depictions of these kinds of variants. ^ But for the existence of the lanthanides the composition of group 3 would not have been a source of any special interest, since scandium, yttrium, lanthanum and actinium exhibit the same gradual change in properties as do calcium, strontium, barium and radium in group 2. ^ The detachment of the lanthanides from the main body of the periodic table has been attributed to the Czech chemist Bohuslav Brauner who, in 1902, allocated all of them ("Ce etc.") to one position in group 4, below zirconium. This arrangement was referred to as the "asteroid hypothesis", in analogy to asteroids occupying a single orbit in the solar system. Before this time the lanthanides were generally (and unsuccessfully) placed throughout groups I to VIII of the older 8-column form of periodic table. Although predecessors of Brauner's 1902 arrangement are recorded from as early as 1895, he is known to have referred to the "chemistry of asteroids" in an 1881 letter to Mendeleev. Other authors assigned all of the lanthanides to either group 3, groups 3 and 4, or groups 2, 3 and 4. In 1922 Niels Bohr continued the detachment process by locating the lanthanides between the s- and d-blocks. In 1949 Glenn T. Seaborg (re)introduced the form of periodic table that is popular today, in which the lanthanides and actinides appear as footnotes. Seaborg first published his table in a classified report dated 1944. It was published again by him in 1945 in Chemical and Engineering News, and in the years up to 1949 several authors commented on, and generally agreed with, Seaborg's proposal. In that year he noted that the best method for presenting the actinides seemed to be by positioning them below, and as analogues of, the lanthanides. See: Thyssen P. and Binnemans K. (2011). "Accommodation of the Rare Earths in the Periodic Table: A Historical Analysis". In K. A. Gschneider Jr. (ed). Handbook on the Physics and Chemistry of the Rare Earths. 41. Amsterdam: Elsevier, pp. 1–94; Seaborg G. T. (1994). Origin of the Actinide Concept'. In K. A. Gschneider Jr. (ed). Handbook on the Physics and Chemistry of the Rare Earths. 18. Amsterdam: Elsevier, pp. 1–27. ^ The phenomenon of different separation groups is caused by increasing basicity with increasing radius, and does not constitute a fundamental reason to show Lu, rather than La, below Y. Thus, among the Group 2 alkaline earth metals, Mg (less basic) belongs in the "soluble group" and Ca, Sr and Ba (more basic) occur in the "ammonium carbonate group". Nevertheless, Mg, Ca, Sr and Ba are routinely collocated in Group 2 of the periodic table. See: Moeller et al. (1989). Chemistry with Inorganic Qualitative Analysis (3rd ed.). SanDiego: Harcourt Brace Jovanovich, pp. 955–956, 958. ^ Even if metallic lawrencium has a p electron, simple modelling studies suggest it will behave like a lanthanide, as do the rest of the late actinides. ^ Notwithstanding, an IUPAC member subsequently wrote that, "IUPAC has not approved any specific form of the periodic table, and an IUPAC-approved form does not exist, though even members of IUPAC themselves have published diagrams titled “IUPAC Periodic Table of the Elements". However, the only specific recommendation IUPAC has made concerning the periodic table covers the Group numbering of 1–18." ^ Karol (2002, p. 63) contends that gravitational effects would become significant when atomic numbers become astronomically large, thereby overcoming other super-massive nuclei instability phenomena, and that neutron stars (with atomic numbers on the order of 1021) can arguably be regarded as representing the heaviest known elements in the universe. See: Karol P. J. (2002). "The Mendeleev–Seaborg periodic table: Through Z = 1138 and beyond". Journal of Chemical Education 79 (1): 60–63. ^ Scerri, one of the foremost authorities on the history of the periodic table, whilst previously recognising the value of a plurality of periodic tables, currently supports the concept of an optimal table. ^ "Chemistry: Four elements added to periodic table". BBC News. 4 January 2016. Archived from the original on 4 January 2016. ^ St. Fleur, Nicholas (1 December 2016). "Four New Names Officially Added to the Periodic Table of Elements". New York Times. Archived from the original on 14 August 2017. ^ a b c d e f Emsley, J. (2011). Nature's Building Blocks: An A-Z Guide to the Elements (New ed.). New York, NY: Oxford University Press. ISBN 978-0-19-960563-7. ^ IUPAC 2016, Table 2, 3 combined; uncertainty removed. ^ CNN, Ashley Strickland. "New elements on the periodic table are named". CNN. Archived from the original on 10 June 2016. Retrieved 11 June 2016. ^ "Discovery and assignment of elements with atomic numbers 113, 115, 117 and 118". International Union of Pure and Applied Chemistry. 30 December 2015. Archived from the original on 13 June 2016. ^ "Hello, Nihonium. Scientists Name 4 New Elements On The Periodic Table". NPR.org. Archived from the original on 10 June 2016. Retrieved 11 June 2016. ^ Koppenol, W. H. (2002). "Naming of New Elements (IUPAC Recommendations 2002)" (PDF). Pure and Applied Chemistry. 74 (5): 787–791. doi:10.1351/pac200274050787. Archived (PDF) from the original on 31 October 2008. ^ Silva, Robert J. (2006). "Fermium, Mendelevium, Nobelium and Lawrencium". In Morss, L. R.; Edelstein, N. M.; Fuger, J. (eds.). The Chemistry of the Actinide and Transactinide Elements (3rd ed.). Dordrecht, The Netherlands: Springer Science+Business Media. ISBN 978-1-4020-3555-5. ^ Messler, R. W. (2010). The essence of materials for engineers. Sudbury, MA: Jones & Bartlett Publishers. p. 32. ISBN 978-0-7637-7833-0. ^ Bagnall, K. W. (1967). "Recent advances in actinide and lanthanide chemistry". In Fields, P. R.; Moeller, T. (eds.). Advances in chemistry, Lanthanide/Actinide chemistry. Advances in Chemistry. 71. American Chemical Society. pp. 1–12. doi:10.1021/ba-1967-0071. ISBN 978-0-8412-0072-2. ^ Day, M. C., Jr.; Selbin, J. (1969). Theoretical inorganic chemistry (2nd ed.). New York: Nostrand-Rienhold Book Corporation. p. 103. ISBN 978-0-7637-7833-0. ^ Holman, J.; Hill, G. C. (2000). Chemistry in context (5th ed.). Walton-on-Thames: Nelson Thornes. p. 40. ISBN 978-0-17-448276-5. ^ a b Connelly, N. G.; Damhus, T.; Hartshorn, R. M.; Hutton, A. T. (2005). Nomenclature of Inorganic Chemistry: IUPAC Recommendations 2005 (PDF). RSC Publishing. p. 51. ISBN 978-0-85404-438-2. ^ Fluck, E. (1988). "New Notations in the Periodic Table" (PDF). Pure Appl. Chem. 60 (3): 431–436. doi:10.1351/pac198860030431. Archived (PDF) from the original on 25 March 2012. Retrieved 24 March 2012. ^ "The constitution of group 3 of the periodic table". IUPAC. 18 December 2015. ^ Stoker, S. H. (2007). General, organic, and biological chemistry. New York: Houghton Mifflin. p. 68. ISBN 978-0-618-73063-6. OCLC 52445586. ^ Mascetta, J. (2003). Chemistry The Easy Way (4th ed.). New York: Hauppauge. p. 50. ISBN 978-0-7641-1978-1. OCLC 52047235. ^ Kotz, J.; Treichel, P.; Townsend, John (2009). Chemistry and Chemical Reactivity, Volume 2 (7th ed.). Belmont: Thomson Brooks/Cole. p. 324. ISBN 978-0-495-38712-1. OCLC 220756597. ^ Jones, C. (2002). d- and f-block chemistry. New York: J. Wiley & Sons. p. 2. ISBN 978-0-471-22476-1. OCLC 300468713. ^ Silberberg, M. S. (2006). Chemistry: The molecular nature of matter and change (4th ed.). New York: McGraw-Hill. p. 536. ISBN 978-0-07-111658-9. ^ Manson, S. S.; Halford, G. R. (2006). Fatigue and durability of structural materials. Materials Park, Ohio: ASM International. p. 376. ISBN 978-0-87170-825-0. ^ Bullinger, H-J. (2009). Technology guide: Principles, applications, trends. Berlin: Springer-Verlag. p. 8. ISBN 978-3-540-88545-0. ^ Jones, B. W. (2010). Pluto: Sentinel of the outer solar system. Cambridge: Cambridge University Press. pp. 169–71. ISBN 978-0-521-19436-5. ^ Hinrichs, G. D. (1869). "On the classification and the atomic weights of the so-called chemical elements, with particular reference to Stas's determinations". Proceedings of the American Association for the Advancement of Science. 18 (5): 112–124. Archived from the original on 2 August 2016. ^ a b Myers, R. (2003). The basics of chemistry. Westport, CT: Greenwood Publishing Group. pp. 61–67. ISBN 978-0-313-31664-7. ^ a b Chang, R. (2002). Chemistry (7 ed.). New York: McGraw-Hill. pp. 289–310, 340–42. ISBN 978-0-07-112072-2. ^ a b Jolly, W. L. (1991). Modern Inorganic Chemistry (2nd ed.). McGraw-Hill. p. 22. ISBN 978-0-07-112651-9. ^ Pauling, L. (1932). "The Nature of the Chemical Bond. IV. The Energy of Single Bonds and the Relative Electronegativity of Atoms". Journal of the American Chemical Society. 54 (9): 3570–3582. Bibcode:1932JAChS..54.2610C. doi:10.1021/ja01348a011. ^ Allred, A. L. (1960). "Electronegativity values from thermochemical data". Journal of Inorganic and Nuclear Chemistry. 17 (3–4): 215–221. doi:10.1016/0022-1902(61)80142-5. Retrieved 11 June 2012. ^ Siekierski, S.; Burgess, J. (2002). Concise chemistry of the elements. Chichester: Horwood Publishing. pp. 35‒36. ISBN 978-1-898563-71-6. ^ Yoder, C. H.; Suydam, F. H.; Snavely, F. A. (1975). Chemistry (2nd ed.). Harcourt Brace Jovanovich. p. 58. ISBN 978-0-15-506465-2. ^ Sacks, O. (2009). Uncle Tungsten: Memories of a chemical boyhood. New York: Alfred A. Knopf. pp. 191, 194. ISBN 978-0-375-70404-8. ^ a b MacKay, K. M.; MacKay, R. A.; Henderson, W. (2002). Introduction to Modern Inorganic Chemistry (6th ed.). Cheltenham: Nelson Thornes. pp. 194–196. ISBN 978-0-7487-6420-4. ^ Remy, H. (1956). Kleinberg, J. (ed.). Treatise on Inorganic Chemistry. 2. Amsterdam: Elsevier. p. 30. ^ Phillips, C. S. G.; Williams, R. J. P. (1966). Inorganic Chemistry. Oxford: Clarendon Press. pp. 4–5. ^ King, R. B. (1995). Inorganic chemistry of main group elements. New York: Wiley-VCH. p. 289. ^ Spedding, F. H.; Beadry, B. J. (1968). "Lutetium". In Hampel, C. A. (ed.). The Encyclopedia of the Chemical Elements. Reinhold Book Corporation. pp. 374–378. ^ Settouti, N.; Aourag, H. (2014). "A Study of the Physical and Mechanical Properties of Lutetium Compared with Those of Transition Metals: A Data Mining Approach". JOM. 67 (1): 87–93. Bibcode:2015JOM....67a..87S. doi:10.1007/s11837-014-1247-x. ^ a b Silva, Robert J. (2011). "Chapter 13. Fermium, Mendelevium, Nobelium, and Lawrencium". In Morss, Lester R.; Edelstein, Norman M.; Fuger, Jean (eds.). The Chemistry of the Actinide and Transactinide Elements. Netherlands: Springer. pp. 1621–1651. doi:10.1007/978-94-007-0211-0_13. ISBN 978-94-007-0210-3. ^ Sato, T. K.; Asai, M.; Borschevsky, A.; Stora, T.; Sato, N.; Kaneya, Y.; Tsukada, K.; Düllman, Ch. E.; Eberhardt, K.; Eliav, E.; Ichikawa, S.; Kaldor, U.; Kratz, J. V.; Miyashita, S.; Nagame, Y.; Ooe, K.; Osa, A.; Renisch, D.; Runke, J.; Schädel, M.; Thörle-Pospiech, P.; Toyoshima, A.; Trautmann, N. (9 April 2015). "Measurement of the first ionization potential of lawrencium, element 103" (PDF). Nature. 520 (7546): 209–211. Bibcode:2015Natur.520..209S. doi:10.1038/nature14342. PMID 25855457. ^ Steele, D. The Chemistry of the Metallic Elements. Oxford: Pergamon Press. p. 67. ^ Greenwood, N. N.; Earnshaw, A. Chemistry of the Elements (2nd ed.). Oxford: Elsevier Science Ltd. p. 1206. ISBN 978-0-7506-3365-9. ^ MacKay, K. M.; MacKay, R. A.; Henderson, W. (2002). Introduction to Modern Inorganic Chemistry (6th ed.). Cheltenham: Nelson Thornes. pp. 194–196, 385. ISBN 978-0-7487-6420-4. ^ Siegfried, R. (2002). From elements to atoms a history of chemical composition. Philadelphia, Pennsylvania: Library of Congress Cataloging-in-Publication Data. p. 92. ISBN 978-0-87169-924-4. ^ Horvitz, L. (2002). Eureka! : Scientific Breakthroughs That Changed The World. New York: John Wiley. p. 43. ISBN 978-0-471-23341-1. OCLC 50766822. ^ van Spronsen, J. W. (1969). The periodic system of chemical elements. Amsterdam: Elsevier. p. 19. ISBN 978-0-444-40776-4. ^ "Alexandre-Emile Bélguier de Chancourtois (1820–1886)" (in French). Annales des Mines history page. Archived from the original on 27 November 2014. Retrieved 18 September 2014. ^ Odling, W. (2002). "On the proportional numbers of the elements". Quarterly Journal of Science. 1: 642–648 (643). ^ a b Scerri, E. (2011). The periodic table: A very short introduction. Oxford: Oxford University Press. ISBN 978-0-19-958249-5. ^ Kaji, M. (2004). "Discovery of the periodic law: Mendeleev and other researchers on element classification in the 1860s". In Rouvray, D. H.; King, R. Bruce (eds.). The periodic table: Into the 21st Century. Research Studies Press. pp. 91–122 (95). ISBN 978-0-86380-292-8. ^ Newlands, J. A. R. (20 August 1864). "On Relations Among the Equivalents". Chemical News. 10: 94–95. Archived from the original on 1 January 2011. ^ Newlands, J. A. R. (18 August 1865). "On the Law of Octaves". Chemical News. 12: 83. Archived from the original on 1 January 2011. ^ Bryson, B. (2004). A Short History of Nearly Everything. Black Swan. pp. 141–142. ISBN 978-0-552-15174-0. ^ Brock, W. H.; Knight, D. M. (1965). "The Atomic Debates: 'Memorable and Interesting Evenings in the Life of the Chemical Society'". Isis. 56 (1): 5–25. doi:10.1086/349922. ^ Kauffman, G. B. (March 1969). "American forerunners of the periodic law". Journal of Chemical Education. 46 (3): 128–135 (132). Bibcode:1969JChEd..46..128K. doi:10.1021/ed046p128. ^ Mendelejew, D. (1869). "Über die Beziehungen der Eigenschaften zu den Atomgewichten der Elemente". Zeitschrift für Chemie (in German): 405–406. ^ Venable, pp. 96–97; 100–102. ^ Pullman, B. (1998). The Atom in the History of Human Thought. Translated by Axel Reisinger. Oxford University Press. p. 227. ISBN 978-0-19-515040-7. ^ Atkins, P. W. (1995). The Periodic Kingdom. HarperCollins Publishers, Inc. p. 87. ISBN 978-0-465-07265-1. ^ a b Samanta, C.; Chowdhury, P. Roy; Basu, D. N. (2007). "Predictions of alpha decay half-lifes of heavy and superheavy elements". Nucl. Phys. A. 789 (1–4): 142–154. arXiv:nucl-th/0703086. Bibcode:2007NuPhA.789..142S. CiteSeerX 10.1.1.264.8177. doi:10.1016/j.nuclphysa.2007.04.001. ^ a b Briggs, Helen (29 January 2019). "Happy birthday, periodic table". Retrieved 8 February 2019. ^ Kaji, M. (2002). "D. I. Mendeleev's Concept of Chemical Elements and the Principle of Chemistry" (PDF). Bull. Hist. Chem. 27 (1): 4–16. Archived (PDF) from the original on 6 July 2016. ^ Adloff, J-P.; Kaufman, G. B. (25 September 2005). "Francium (Atomic Number 87), the Last Discovered Natural Element". The Chemical Educator. Archived from the original on 4 June 2013. Retrieved 26 March 2007. ^ Hoffman, D. C.; Lawrence, F. O.; Mewherter, J. L.; Rourke, F. M. (1971). "Detection of Plutonium-244 in Nature". Nature. 234 (5325): 132–134. Bibcode:1971Natur.234..132H. doi:10.1038/234132a0. ^ Deming, H. G. (1923). General chemistry: An elementary survey. New York: J. Wiley & Sons. pp. 160, 165. ^ Abraham, M.; Coshow, D.; Fix, W. Periodicity:A source book module, version 1.0 (PDF). New York: Chemsource, Inc. p. 3. Archived from the original (PDF) on 14 May 2012. ^ Emsley, J. (7 March 1985). "Mendeleyev's dream table". New Scientist: 32–36(36). ^ Fluck, E. (1988). "New notations in the period table". Pure and Applied Chemistry. 60 (3): 431–436 (432). doi:10.1351/pac198860030431. ^ Masterton, W. L.; Hurley, C. N.; Neth, E. J. (31 January 2011). Chemistry: Principles and reactions (7th ed.). Belmont, CA: Brooks/Cole Cengage Learning. p. 173. ISBN 978-1-111-42710-8. ^ Barber, R. C.; Karol, P. J.; Nakahara, Hiromichi; Vardaci, Emanuele; Vogt, E. W. (2011). "Discovery of the elements with atomic numbers greater than or equal to 113 (IUPAC Technical Report)". Pure Appl. Chem. 83 (7): 1485. doi:10.1351/PAC-REP-10-05-01. ^ Эксперимент по синтезу 117-го элемента получает продолжение [Experiment on synthesis of the 117th element is to be continued] (in Russian). JINR. 2012. Archived from the original on 1 August 2013. ^ Newell, S. B. (1980). Chemistry: An introduction. Boston: Little, Brown and Company. p. 196. ISBN 978-0-316-60455-0. Retrieved 27 August 2016. ^ a b Jensen, William B. (1986). "Classification, symmetry and the periodic table" (PDF). Comp. & Maths. With Appls. 12B (I/2). Retrieved 18 January 2017. ^ Leach, M. R. (2012). "Concerning electronegativity as a basic elemental property and why the periodic table is usually represented in its medium form". Foundations of Chemistry. 15 (1): 13–29. doi:10.1007/s10698-012-9151-3. ^ Thyssen, P.; Binnemans, K. (2011). Gschneidner Jr., K. A.; Bünzli, J-C.G; Vecharsky, Bünzli (eds.). Accommodation of the Rare Earths in the Periodic Table: A Historical Analysis. Handbook on the Physics and Chemistry of Rare Earths. 41. Amsterdam: Elsevier. p. 76. ISBN 978-0-444-53590-0. ^ Finding Aid to Edward G. Mazurs Collection of Periodic Systems Images. Science History Institute. Click on 'Finding Aid' to go to full finding aid. ^ "Weird Words of Science: Lemniscate Elemental Landscapes". Fields of Science. fieldofscience.com. 22 March 2009. Archived from the original on 4 March 2016. Retrieved 4 January 2016. ^ Emsely, J.; Sharp, R. (21 June 2010). "The periodic table: Top of the charts". The Independent. Archived from the original on 1 July 2017. ^ Seaborg, G. (1964). "Plutonium: The Ornery Element". Chemistry. 37 (6): 14. ^ Mark R. Leach. "1925 Courtines' Periodic Classification". Archived from the original on 16 May 2016. Retrieved 16 October 2012. ^ Mark R. Leach. "1949 Wringley's Lamina System". Archived from the original on 3 December 2011. Retrieved 16 October 2012. ^ Mazurs, E. G. (1974). Graphical Representations of the Periodic System During One Hundred Years. Alabama: University of Alabama Press. p. 111. ISBN 978-0-8173-3200-6. ^ Mark R. Leach. "1996 Dufour's Periodic Tree". Archived from the original on 18 April 2010. Retrieved 16 October 2012. ^ Mark R. Leach. "1989 Physicist's Periodic Table by Timothy Stowe". Archived from the original on 5 June 2012. Retrieved 16 October 2012. ^ Bradley, D. (20 July 2011). "At last, a definitive periodic table?". ChemViews Magazine. doi:10.1002/chemv.201000107. Archived from the original on 1 May 2013. ^ Mark R. Leach. "2002 Inorganic Chemist's Periodic Table". Archived from the original on 9 March 2013. Retrieved 16 October 2012. ^ Scerri, E. (2008). "The role of triads in the evolution of the periodic table: Past and present". Journal of Chemical Education. 85 (4): 585–589 (589). Bibcode:2008JChEd..85..585S. doi:10.1021/ed085p585. ^ Alper, R. (2010). "The simplified periodic table: elements ordered by their subshells". The Journal of Biological Physics and Chemistry. 10 (2): 74–80. doi:10.4024/43AL09F.jbpc.10.02. ^ a b Scerri, E. (2012). "Some comments on the recently proposed periodic table featuring elements ordered by their subshells". Journal of Biological Physics and Chemistry. 12 (2): 69–70. ^ Bent, H. A.; Weinhold, F. (2007). "Supporting information: News from the periodic table: An introduction to "Periodicity symbols, tables, and models for higher-order valency and donor–acceptor kinships"". Journal of Chemical Education. 84 (7): 3–4. doi:10.1021/ed084p1145. ^ Francl, M. (May 2009). "Table manners" (PDF). Nature Chemistry. 1 (2): 97–98. Bibcode:2009NatCh...1...97F. doi:10.1038/nchem.183. PMID 21378810. Archived (PDF) from the original on 25 October 2012. ^ IUPAC (1 May 2013). "IUPAC Periodic Table of the Elements" (PDF). iupac.org. IUPAC. Archived from the original (PDF) on 22 August 2015. Retrieved 20 September 2015. ^ Cox, P. A. (2004). Inorganic Chemistry (2nd ed.). London: Bios Scientific. p. 149. ISBN 978-1-85996-289-3. ^ Rayner-Canham, G.; Overton, T. (1 January 2006). Descriptive inorganic chemistry (4th ed.). New York: W H Freeman. p. 203. ISBN 978-0-7167-8963-5. ^ Wilson, P (2013). "Hydrogen adopts alkali metal position". Chemistry World'. Royal Society of Chemistry. Retrieved 12 April 2019. ^ Bodner, G. M.; Rickard, L. H.; Spencer, J. N. (1995). Chemistry: Structure and Dynamics. John Wiley & Son. p. 101location=New York. ISBN 978-0-471-14278-2. ^ Seaborg, G. (1945). "The chemical and radioactive properties of the heavy elements". Chemical English Newspaper. 23 (23): 2190–2193. doi:10.1021/cen-v023n023.p2190. ^ Cronyn, M. W. (August 2003). "The Proper Place for Hydrogen in the Periodic Table". Journal of Chemical Education. 80 (8): 947–951. Bibcode:2003JChEd..80..947C. doi:10.1021/ed080p947. ^ Lewars, Errol G. (5 December 2008). Modeling Marvels: Computational Anticipation of Novel Molecules. Springer Science & Business Media. pp. 69–71. ISBN 978-1-4020-6973-4. Archived from the original on 19 May 2016. ^ Thyssen, P.; Binnemans, K. (2011). Gschneidner Jr., K. A.; Bünzli, J-C.G; Vecharsky, Bünzli (eds.). Accommodation of the Rare Earths in the Periodic Table: A Historical Analysis. Handbook on the Physics and Chemistry of Rare Earths. 41. Amsterdam: Elsevier. pp. 1–94. ISBN 978-0-444-53590-0. ^ Hevesy, G. (1929). Redkie zemeli s tochki zreniya stroeniya atoma [Rare earths from the point of view of structure of atom] (cited in Trifonov 1970, p. 188) (in Russian). Leningrad: NKhTI. ^ Stewart, P. J. (2008). "The Flyleaf Table: An Alternative". Journal of Chemical Education. 85 (11): 1490. Bibcode:2008JChEd..85.1490S. doi:10.1021/ed085p1490. ^ Thyssen, P.; Binnemanns, K. (2011). "1: Accommodation of the rare earths in the periodic table: A historical analysis". In Gschneidner Jr., K. A.; Büzli, J-C. J.; Pecharsky, V. K. (eds.). Handbook on the Physics and Chemistry of Rare Earths. 41. Amsterdam: Elsevier. pp. 80–81. ISBN 978-0-444-53590-0. ^ Keeler, J.; Wothers, P. (2014). Chemical Structure and Reactivity: An Integrated Approach. Oxford: Oxford University. p. 259. ISBN 978-0-19-960413-5. ^ Scerri, E. (2012). "Mendeleev's Periodic Table Is Finally Completed and What To Do about Group 3?". Chemistry International. 34 (4). doi:10.1515/ci.2012.34.4.28. Archived from the original on 5 July 2017. ^ Castelvecchi, D. (8 April 2015). "Exotic atom struggles to find its place in the periodic table". Nature. doi:10.1038/nature.2015.17275. Archived from the original on 5 October 2015. Retrieved 20 September 2015. ^ "The constitution of group 3 of the periodic table". IUPAC. 2015. Archived from the original on 5 July 2016. Retrieved 30 July 2016. ^ Emsley, J. (2011). Nature's Building Blocks (new ed.). Oxford: Oxford University. p. 651. ISBN 978-0-19-960563-7. ^ a b c d e f g h William B. Jensen (1982). "The Positions of Lanthanum (Actinium) and Lutetium (Lawrencium) in the Periodic Table". J. Chem. Educ. 59 (8): 634–636. Bibcode:1982JChEd..59..634J. doi:10.1021/ed059p634. ^ Trifonov, D. N. (1970). Rare-earth elements and their position in the periodic system (translated from Russian). New Delhi: Indian National Scientific Documentation Centre. pp. 201–202. ^ Greenwood, N. N.; Harrington, T. J. (1973). The chemistry of the transition elements. Oxford: Clarendon Press. p. 50. ISBN 978-0-19-855435-6. ^ Aylward, G.; Findlay, T. (2008). SI chemical data (6th ed.). Milton, Queensland: John Wiley & Sons. ISBN 978-0-470-81638-7. ^ Wiberg, N. (2001). Inorganic Chemistry. San Diego: Academic Press. p. 119. ISBN 978-0-12-352651-9. ^ Wulfsberg, G. (2006). "Periodic table: Trends in the properties of the elements". Encyclopedia of Inorganic Chemistry. New York: John Wiley & Sons. p. 3. ISBN 978-0-470-86210-0. ^ a b Cotton, S. (2007). Lanthanide and Actinide Chemistry. Chichester: John Wiley & Sons. p. 150. ISBN 978-0-470-01006-8. ^ Jensen, W. B. (2015). "Some Comments on the Position of Lawrencium in the Periodic Table" (PDF). Archived from the original (PDF) on 23 December 2015. Retrieved 20 September 2015. ^ Xu, W-H.; Pyykkö, P. (2016). "Is the chemistry of lawrencium peculiar?". Physical Chemistry Chemical Physics. 18 (26): 17351–17355. Bibcode:2016PCCP...1817351X. doi:10.1039/C6CP02706G. PMID 27314425. ^ King, R. B. (1995). Inorganic Chemistry of Main Group Elements. New York: Wiley-VCH. p. 289. ISBN 978-1-56081-679-9. ^ Leigh, G. J. (2009). "Periodic Tables and IUPAC". Chemistry International. 31 (1). Retrieved 27 November 2018. ^ Scerri, P.; Parsons, B. (2018). "What elements belong in group 3 of the Periodic Table?". In Scerri, E.; Restrepo, G. (eds.). From Mendeleev to Oganesson: A Multidisciplinary Perspective on the Periodic Table. New York: Oxford University Press. pp. 140–151. ISBN 978-0-190-66853-2. ^ Lee, J. D. (1996). Concise inorganic chemistry (5th ed.). Oxford: Blackwell-Science. p. 679. ISBN 978-0-6320-5293-6. ^ Xuefang, W.; Andrews, L.; Riedel, S.; Kaupp, M. (2007). "Mercury Is a Transition Metal: The First Experimental Evidence for HgF4". Angew. Chem. Int. Ed. 46 (44): 8371–8375. doi:10.1002/anie.200703710. PMID 17899620. ^ a b Jensen, W. B. (2008). "Is Mercury Now a Transition Element?". J. Chem. Educ. 85 (9): 1182–1183. Bibcode:2008JChEd..85.1182J. doi:10.1021/ed085p1182. ^ Rayner-Canham, G.; Overton, T. (1 January 2006). Descriptive inorganic chemistry (4th ed.). New York: W H Freeman. pp. 484–485. ISBN 978-0-7167-8963-5. ^ Schändel, M. (2003). The Chemistry of Superheavy Elements. Dordrecht: Kluwer Academic Publishers. p. 277. ISBN 978-1-4020-1250-1. ^ Yakushev, Alexander; Eichler, Robert (2016). Gas-phase chemistry of element 114, flerovium (PDF). Nobel Symposium NS160 – Chemistry and Physics of Heavy and Superheavy Elements. doi:10.1051/epjconf/201613107003. ^ Fricke, B.; Greiner, W.; Waber, J. T. (1971). "The continuation of the periodic table up to Z = 172. The chemistry of superheavy elements". Theoretica Chimica Acta. 21 (3): 235–260. doi:10.1007/BF01172015. ^ Frazier, K. (1978). "Superheavy Elements". Science News. 113 (15): 236–238. doi:10.2307/3963006. JSTOR 3963006. ^ Pyykkö, P. (2011). "A suggested periodic table up to Z ≤ 172, based on Dirac–Fock calculations on atoms and ions". Physical Chemistry Chemical Physics. 13 (1): 161–168. Bibcode:2011PCCP...13..161P. doi:10.1039/c0cp01575j. PMID 20967377. ^ van der Schoor, K. (2016). Electronic structure of element 123 (PDF) (Thesis). Rijksuniversiteit Groningen. ^ Elliot, Q. A. (1911). "A modification of the periodic table". Journal of the American Chemical Society. 33 (5): 684–688 (688). doi:10.1021/ja02218a004. ^ Seaborg, G. (c. 2006). "transuranium element (chemical element)". Encyclopædia Britannica. Archived from the original on 30 November 2010. Retrieved 16 March 2010. ^ Cwiok, S.; Heenen, P.-H.; Nazarewicz, W. (2005). "Shape coexistence and triaxiality in the superheavy nuclei". Nature. 433 (7027): 705–9. Bibcode:2005Natur.433..705C. doi:10.1038/nature03336. PMID 15716943. ^ a b Ball, P. (November 2010). "Would Element 137 Really Spell the End of the Periodic Table? Philip Ball Examines the Evidence". Chemistry World. Archived from the original on 21 October 2012. Retrieved 30 September 2012. ^ Gambhir, Y.K; Bhagwat, A.; Gupta, M. (2015). "The highest limiting Z in the extended periodic table". Journal of Physics G: Nuclear and Particle Physics. 42 (12): 125105. doi:10.1088/0954-3899/42/12/125105. ^ Eisberg, R.; Resnick, R. (1985). Quantum Physics of Atoms, Molecules, Solids, Nuclei and Particles. Wiley. ^ Bjorken, J. D.; Drell, S. D. (1964). Relativistic Quantum Mechanics. McGraw-Hill. ^ Greiner, W.; Schramm, S. (2008). "Resource Letter QEDV-1: The QED vacuum". American Journal of Physics. 76 (6): 509. Bibcode:2008AmJPh..76..509G. doi:10.1119/1.2820395. , and references therein. ^ a b Scerri, Eric (9 August 2013). "Is there an optimal periodic table and other bigger questions in the philosophy of science". ericscerri23.blogspot.com.au. Eric Scerri. Archived from the original on 13 June 2017. Retrieved 4 September 2013. ^ Sella, Andrea (7 August 2013). "An elementary history lesson". New Scientist (2929). Archived from the original on 3 July 2016. Retrieved 13 June 2017. ^ Scerri, Eric (29 January 2019). "Happy sesquicentennial to the periodic table of the elements". Oxford University Press. Retrieved 12 April 2019. Ball, P. (2002). The Ingredients: A Guided Tour of the Elements. Oxford: Oxford University Press. ISBN 978-0-19-284100-1. Chang, R. (2002). Chemistry (7th ed.). New York: McGraw-Hill Higher Education. ISBN 978-0-19-284100-1. Gray, T. (2009). The Elements: A Visual Exploration of Every Known Atom in the Universe. New York: Black Dog & Leventhal Publishers. ISBN 978-1-57912-814-2. Greenwood, N. N.; Earnshaw, A. (1984). Chemistry of the Elements. Oxford: Pergamon Press. ISBN 978-0-08-022057-4. Huheey, J. E.; Keiter, E. A.; Keiter, R. L. Principles of structure and reactivity (4th ed.). New York: Harper Collins College Publishers. ISBN 978-0-06-042995-9. Moore, J. T. (2003). Chemistry For Dummies. For Dummies (1st ed.). New York: Wiley Publications. ISBN 978-0-7645-5430-8. Scerri, E. (2007). The periodic table: Its story and its significance. Oxford: Oxford University Press. ISBN 978-0-19-530573-9. Scerri, E. (2011). The periodic table: A very short introduction. Oxford: Oxford University Press. ISBN 978-0-19-958249-5. Venable, F. P. (1896). The Development of the Periodic Law. Easton, Pennsylvania: Chemical Publishing Company. OCLC 776059614. Emsley, J. (2011). "The Periodic Table". Nature's Building Blocks: An A-Z Guide to the Elements (New ed.). Oxford: Oxford University Press. pp. 634–651. ISBN 978-0-19-960563-7. Mazurs, E. G. (1974). Graphical Representations of the Periodic System During One Hundred Years. Alabama: University of Alabama Press. ISBN 978-0-19-960563-7. Scerri, E (n.d.). "Books on the Elements and the Periodic Table" (PDF). Retrieved 9 July 2018.
van Spronsen, J. W. (1969). The Periodic System of Chemical Elements: A History of the First Hundred Years. Amsterdam: Elsevier. ISBN 978-0-444-40776-4. Periodic Table featured topic page on Science History Institute Digital Collections featuring select visual representations of the periodic table of the elements, with an emphasis on alternative layouts including circular, cylindrical, pyramidal, spiral, and triangular forms.